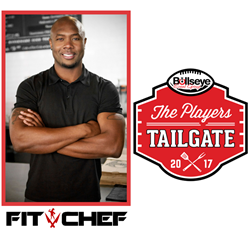 Celebrity "Fit Chef" Eddie Jackson joins an all-star culinary crew at Bullseye Event Group's 2017 Players Tailgate at Super Bowl LI, joining chef Guy Fieri to create the biggest, baddest, pre-game VIP Super Bowl tailgate in Houston. Bullseye Event Group is excited to announce that celebrity “Fit Chef” Eddie Jackson will be joining the star studded celebrity chef culinary crew for the 2017 Players Tailgate at Super Bowl LI in Houston, alongside chef Guy Fieri! Eddie Jackson will join Guy Fieri in creation of an exclusive VIP menu, available to all Players Tailgate VIP guests. Guy Fieri will be adding several more Celebrity Chefs to make this the best line up of Chefs assembled. The exclusive menu will be released in the coming weeks on BullseyeEventGroup.com. With over 25 NFL players and some of the biggest celebrities, Bullseye’s 2017 Players Tailgate at Super Bowl LI will be the biggest and best pre-game tailgate in Houston. One of America’s favorite chefs, Guy Fieri, will be returning to create the VIP menu, joined by chefs Eddie Jackson and Aaron May. Alongside Fieri at Super Bowl 50 in San Francisco, the 2016 Players Tailgate featured Fox Sports reporter and emcee Erin Andrews, Victoria’s Secret model Adriana Lima, celebrity chefs May and G Garvin, all-pro NFL players and more. Tickets to the 2017 Players Tailgate at Super Bowl LI in Houston can be purchased directly from BullseyeEventGroup.com, or are included in all of Bullseye’s Super Bowl LI Travel Packages. Bullseye Event Group’s Super Bowl LI Travel Packages offer fans the chance to cross the NFL’s biggest game off their bucket list, without handling any of the logistics! A VIP experience throughout Super Bowl weekend in Houston includes some of the most luxurious hotels in the Houston area! Super Bowl LI travel packages also include entrance into a Super Bowl welcome reception (featuring food, a premium open bar and a live DJ), a ticket to Super Bowl LI, private motor coach transportation to and from the stadium on game day and entrance into Bullseye’s 2017 Players Tailgate at Super Bowl LI. Call Bullseye Event Group today at 317-800-5820 for pricing and insider information regarding the Super Bowl LI Travel Packages and the 2017 Players Tailgate at Super Bowl LI! The official events and travel partner of the Indianapolis Colts, Bullseye Event Group offers fans VIP experiences as a secure, official source for travel, hotel, pre-game parties and game tickets. Bullseye is a direct and dependable source for tickets to the Colts VIP Tailgate, Super Bowl travel packages, the Players Tailgate at Super Bowl LI, Gate 6 Hospitality at the Masters and more. To learn more about Bullseye Event Group, visit BullseyeEventGroup.com.